Use the confirmatory deed when correcting errors in a deed of conveyance in Maryland, such as a warranty, special warranty, or quitclaim deed. 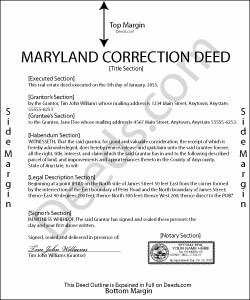 In Maryland, the original deed cannot be amended for rerecording. If any changes or corrections are made, it becomes a supplemental instrument only and must follow requirements for such instruments. Instead, a newly drafted confirmatory deed, executed, acknowledged, and recorded, will have full legal status. It is in effect an explanation and correction of an error in a prior instrument and passes no title by itself. Beyond the correction, it restates the information given in the prior deed, thus reiterating and confirming it. The reason for the correction must be given by indicating the type of error to be corrected, and the original conveyance must be stated by date of execution and recording, recording number and location. A confirmatory deed should be executed from the original grantor to the original grantee. Maryland statutes require that the "party or parties affected" sign a deed (3-301(c)), which generally includes the grantee. Specific defects in instruments, according to Md. Ann. Code art. 4-109, are a defective acknowledgment, failure to attach any clerk's certificate, omission of a notary seal or other seal, and lack of or improper acknowledgment or affidavit of consideration, agency, or disbursement. Deeds of confirmation are most appropriate for minor errors and omissions in the original deed, such as misspelled names, omission of marital status, or typos in the legal description. More substantial changes, such as adding a name to the title, changing the vesting information or the legal description of the property, may require a new deed of conveyance instead of a confirmatory deed. In addition, if the confirmatory deed effects a change of ownership or addition of land in the legal description, it must be presented to the assessment office for review before being recorded.